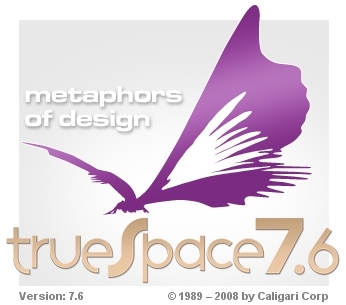 This is a free 3d program called Truespace. It's very easy to learn however without updates. The project has been dead since 2008. This download is no longer available on the Caligari website so I uploaded it here for all 3d modelers to enjoy. This is release 7.6 and is fairly stable. Thanks for the download! I remember when this was announced as a freebee but I kept putting it off until I forgot about it. I've been doing 3D stuff since the first release of PovRay and wonder what would be the advantage of using Truespace as opposed to Blender? I'm not a fanboy by any means but it seems both are free and from what I've seen so far Blender seems to have many more abilities.